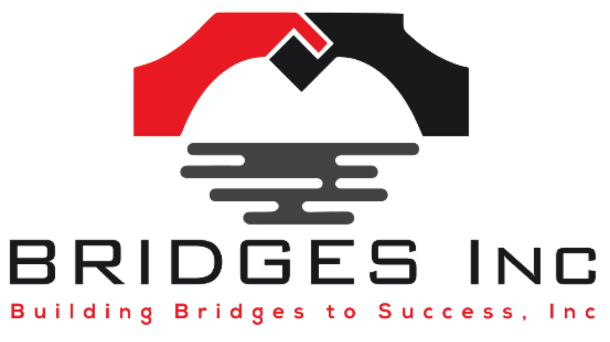 Ward 7 Residents, Stakeholders Successfully Advocate for a Clean Anacostia River - Bridges Inc.
Anacostia Park and Anacostia River are lovely and peaceful, a reprieve from hectic city life. They are community assets. Except the Anacostia River has not realized its tremendous potential given the amount of contamination from years of dumping, seepage, and general disregard for the river’s health. DC government has been investing in the cleanup of the Anacostia River for the past several years. Millions of dollars are allocated to this effort in the capital budget. Until Mayor Bowser proposed her FY 2018 budget. Her capital budget eliminated funding in FY 2018 that had previously been committed. The community responded with action. 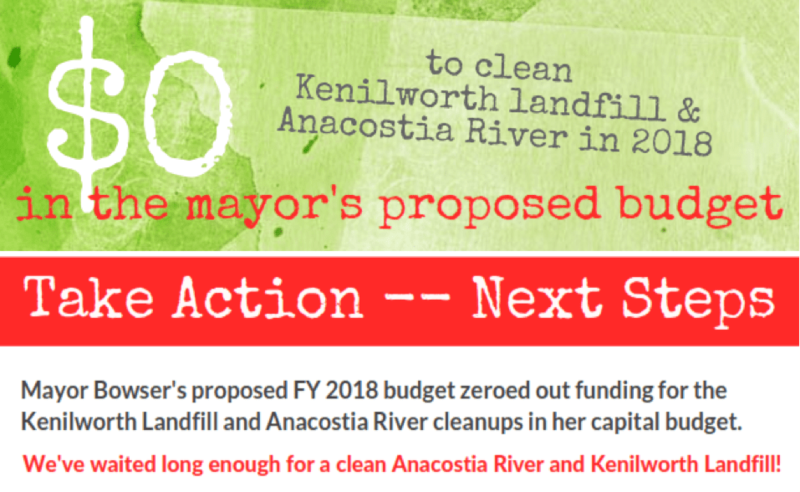 Ward 7 residents worked with the Anacostia Park and Community Collaborative (APACC) to launch an education and engagement campaign directed at the DC Council to fund the Anacostia River and Kenilworth landfill cleanups. The campaign focused on one-on-one conversations with residents who live near the river, broad-based letter writing, meeting presentations, and social media. Keith Kitchen, pastor of the Zion Baptist Church of Eastland Gardens and APACC member, convened several meetings to engage those living in neighborhoods located between Anacostia Park and River and 295. “We were not going to stand for a slow-down of progress cleaning the Anacostia River,” said Kitchen. “The land and water are contaminated. We have waited our turn. We have waited long enough,” he continued. 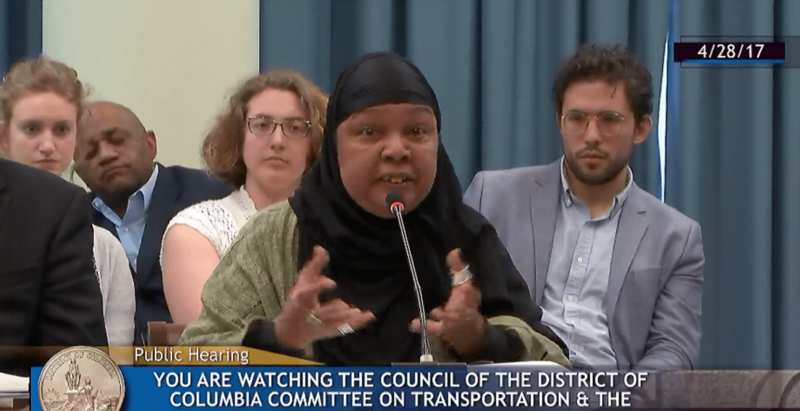 Three-year Parkside resident Inga Spurlock, testifying at the April 28 Committee on Transportation and the Environment budget hearing, said this issue affects the lives of 6,000 residents, people of color who drive buses and operate trains, provide day care and pick up trash, all during the day when budget hearings are held. “We are all entitled to come home to a safe and non-hazardous environment.” She called on Councilmember Mary Cheh to put the $4 million back into the budget. The work paid off. 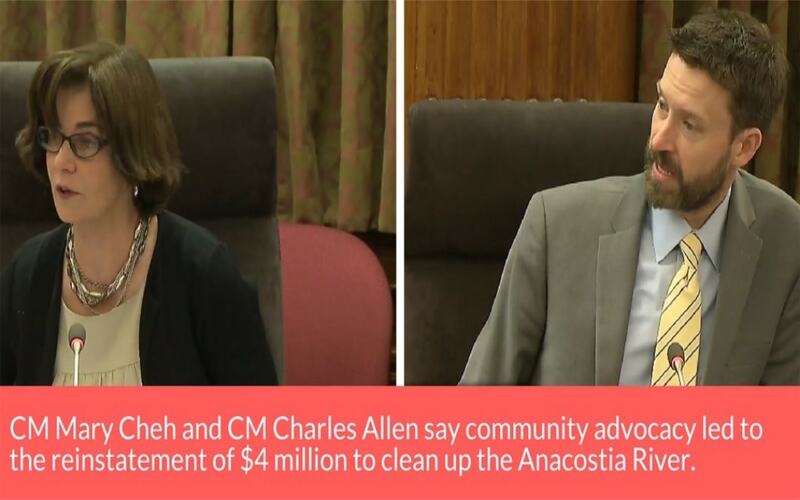 At the committee’s budget mark-up in April, Committee Chair Mary Cheh and committee member Charles Allen (Ward 6) were emphatic: the reinstatement of funding cut from the FY 2017 approved budget to the FY 2018 budget was due directly to the community’s advocacy. The committee put $4 million into the capital budget, $500,000 from the plastic bag tax fund and $3.5 million from a reallocation elsewhere. Click here to watch the April 28 DOEE budget hearing; APACC members start at 1:30:48.